Many people will argue that firearms safety precautions defeat the purpose of having a firearm in the particular place. However if you have decided that keeping a gun, pistol or firearm at home is imperative to your safety, then it’ very important for you to ensure that it is securely stored. Following certain tips can ensure that your gun is safely stored at a place in home which is out of reach of kids and other family members. While following these precautions, you must also take care that your firearm is easily accessible at times when you need them most. Here we discuss few precautionary steps which can be followed for safe gun storage at home. Lets check them out below! It is worth mentioning that as a responsible firearm owner you must always keep your firearm unloaded, until it is time to use. This will help prevent any type of accident or damages it can make while handling. Additionally you should make sure that young kids at your home are well aware about the safety guidelines concerning firearms. ✓ Note: Firearms can be a matter of great curiosity for children, hence try to explain them in detail about the risk of handling the firearms without proper care. Handling your guns safely and with utmost care is very important. Care that you know about how to operate them before you use them for the very first time. Another important tip is to take care that you keep your firearms pointed in the safest possible direction. A safe direction is must to prevent from accidental discharge of the firearm and also to prevent from damages caused. You must always keep this in your mind to only point out firearm at an object you intend to shoot; it should not be towards any human being. Also take care that you avoid handling firearms or pistols when you are consuming alcoholic beverages. ✓ Note: Even when you are on a prescription medication of any kind, you must consult your physician whether it is safe for you to handle them or not. Placing your firearms in a secure storage location is very important, especially after returning from a duck or bird hunting trip. The best way to get safe gun storage at home is by storing them in specially designed gun lock boxes. This will prevent any type of unauthorized use of firearm. We recommend using a biometric gun or pistol safe for storing all your firearms and ammunition. It will not only keep them safe but also in good clean condition for long time. Especially when you are concerned about small children at home, these firearms when stored safely cannot be unlocked by them without your prior permission. In addition to using a good gun vault or storage, you should not ignore using a best gun locking device that makes your gun inoperable, when not in use. You should essentially use a gun lock for additional safety precaution; believe me its not just a substitute for secure storage. ✓ Note: Avoid storing your firearms in fabric, leather case or in their original cardboard boxes. These can attract moisture and can cause them great damage. While lying in the gun safe, your defensive firearms are generally exposed to dampness, mildew and moisture which can overtime breed fungi and mold eventually. Particularly, if you are living in a coastal region, there is a high risk of moisture exposure and damages caused on your firearms which can be seen in the form of heavy rust. To keep your guns away from the rust damages, caused by humidity, keeping them safely in a gun vault is not enough. You actually need to know how to dehumidify pistol safe so that your firearms can rest safely around the dry air. ✓ Note: The best bet is to invest in a good gun safe dehumidifier and bit of few other accessories. When its time to keep your guns away for long term, you should know about how to store guns in safe properly. First of all, before keeping them in a storage, you should get your gun and its parts professionally cleaned. You can use a device like Hornady ultrasonic gun cleaner at your home, if you wish to save some time and dollars. 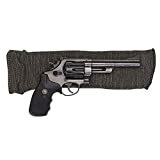 When you have cleaned your firearm properly, its time to pack it using a gun sock or a protective gun sleeve. You can use these protective socks or sleeves for your guns while placing them in gun safe for long term or while transporting them safely from one place to another. ✓ Note: We strongly recommend using silicone gun socks which helps in preventing your guns and rifles from getting rust. Do not ignore these as its a matter of safety for your firearms as well as your family members. Hopefully you would definitely NOT love to risk them at any cost!